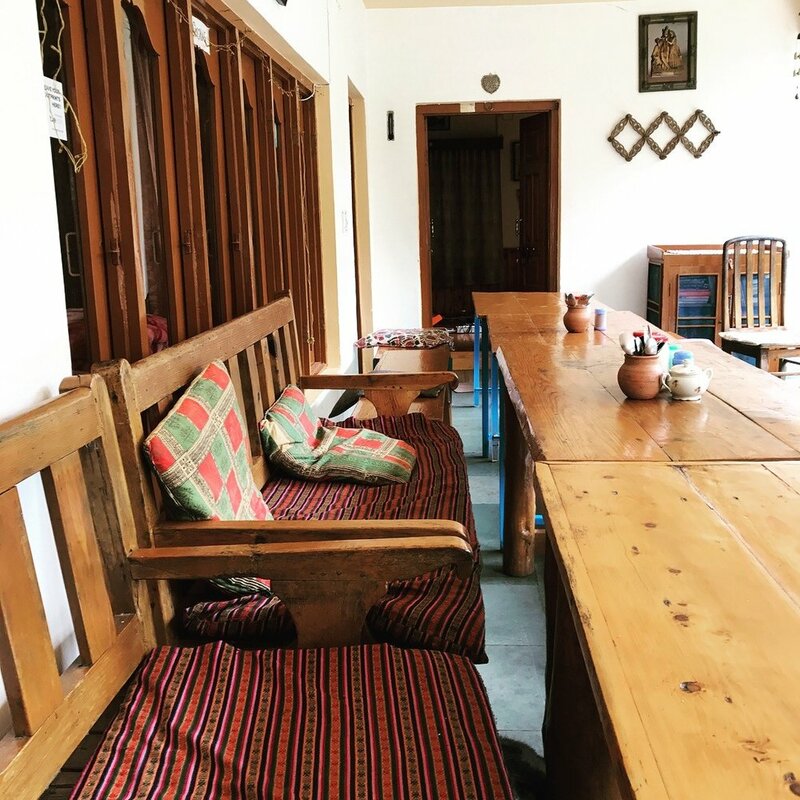 The villages that make up Upper Dharamsala (Mcleod Ganj, Dharamkot and Bhagsu) are home to some amazing restaurants and cafes, and those below are my absolute favorites. Not only do the places I’m about to describe serve beautiful, delicious, nourishing food in cozy, inviting spaces with friendly service, their prices will make your jaw drop in disbelief. But stay here long enough and you'll get used to it. You'll realize you’re beyond spoiled rotten when you come to feel that $5 for a lunch is overpriced. My favorite places were (in Dharamkot) Bodhi Greens Organic Vegan Café (wonderful smoothies, salads – try the Mediterranean salad with tahini added - Buddha Bowls and incredible desserts – I’m still dreaming about the carrot cake and the Oreo cake) where the food is so satisfying, even if you’re not vegan you’ll leave here full and happy, Cool Talk Café (open air, comfortable, the best iced coffee ever, the best momos in town even though they’re not on the menu and veg pakoras that are out of this world), Trek & Dine (beautiful second floor, incredible pizza and pasta and the “special” Milky Bar Chapati dessert is a must try ... unless you have an addictive personality in which case you may be better off not ever taking the first bite) and Moonlight Café (cozy, inviting, and the chicken sizzler is unbelievable). If you’re in the mood for peace and quiet, Joy Food is also a lovely place to eat and study or read with a great view and they make a fantastic coconut vegetable curry, although they close for part of the year. In Mcleod Ganj, Illiterati is the place that will steal your heart and charm you into wanting to stay forever. A 15 minute walk down from the main square on Jogiwara Rd, it’s an exquisitely designed coffee shop/café with gorgeous black slate floor, walls lined with books and stunning views, full of good vibes, delicious food and an ambience that invites you to linger all day curled up with a book. At night it shapeshifts and assumes the atmosphere of a quiet, romantic restaurant where you can enjoy a candlelit dinner. And some evenings it puts a livelier foot forward, with live music. 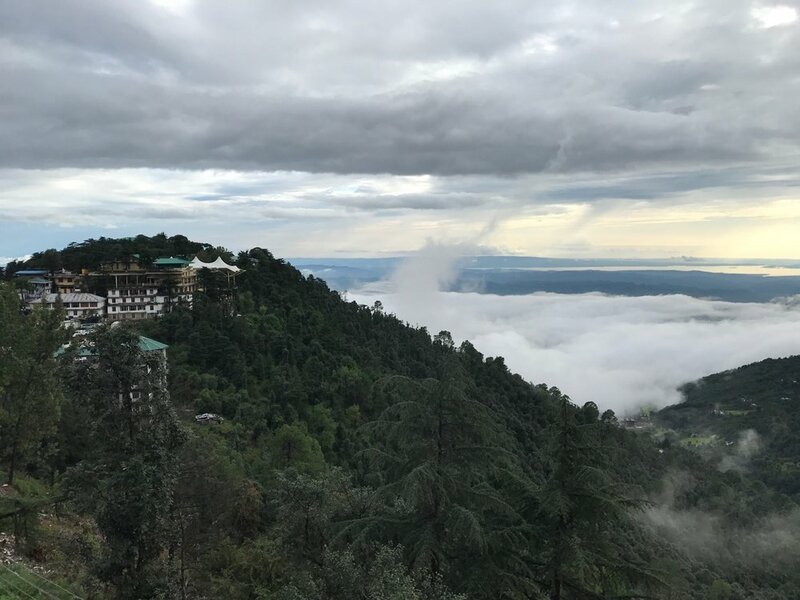 Khaana Nirvana – The Café, near the temple, is another great find with spectacular views in the daytime, delicious Indian food (try the kadhai paneer), good wine and live music on the weekends. (By the way, a note on Indian wine: Sula 2016 Cabernet Shiraz is delicious.) If you’re a dosa lover like I am, you’ll be happy to know you can find them on Temple Rd, at Bala's, where they serve huge tasty ones and good sweet chai, although when we were there there was only one chef so if you go with a large party, go with patience. Ri Café is a hidden gem of a Korean restaurant, usually very quiet, with delicious bibimbab and a gorgeous violet colored hot anchan ginger tea. And if you’re a chocolate lover, don’t leave Mcleod without trying the Tibet Special Bar (my mouth waters even as I type this...) which you can find at the Tibet Quality Bakery on Jogiwara Rd, a 5 minute walk from the main square. It just might be the best thing you’ve ever tasted. They also offer yak cheese and baggage storage, in case either of those happen to be something you’re looking for. In Bhagsu, a 10 minute hilly trek from Dharamkot, I discovered Trimurti Garden Café, a place reminiscent of Bali with a wide inviting shady porch and a spacious lawn bordered with tropical foliage, offering refreshing homemade kombucha and delicious freshly baked bread, another place I wanted to stay all day. Nearby you'll also find Nature Twins Café, with the best masala chai I tasted my entire stay in India (the Cardamom & Ginger Masala Chai) and fantastically comfortable seating at the low table in the corner. If you come here, I hope you get to visit some of these spots! There are many other great options too but these were the places I loved the most. Some of them might be hard to find on a map, but just ask around when you’re there and you’ll find them. (Left to right): Tibet Quality Bakery; a giant dosa at Bala's; Nature Twins Cafe; the view from Khaana Nirvana; the inviting porch at Trimurti Gardens; iced coffee at Cool Talk Cafe; Milky Bar Chapati and cappuccino at Trek n Dine; Dharamkot's main street by night.